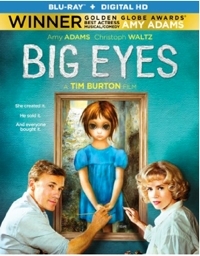 Big Eyes isn’t your usual Tim Burton film. Though there’s a twisted aspect to the relationship between painter Margaret Keane and her controlling husband Walter—along with a vibe that’s faintly reminiscent of Edward Scissorhands—it’s still a pretty straightforward biopic. But don’t be misled by the box blurb announcing that Amy Adams won the Golden Globe for Best Actress in a Musical/Comedy. Big Eyes is neither. It’s a drama made fascinating by Adams’ flawless performance, with occasional comedic moments provided by Christoph Waltz’s brilliant-but-delusional P.T. Barnum-like antics as Walter Keane. Walter manipulates the art world and the buying public as much as he does his wife, whose paintings he takes credit for—first, to make a sale, then, because it feeds his ego. Throughout the Sixties they continue this charade, with Walter rising as a public figure and Margaret shrinking to even smaller dimensions than when they first met and she was overwhelmed by his personality. You forget that it’s a Tim Burton film until Margaret goes grocery shopping and has hallucinations of all the other shoppers looking at her with the trademark “big eyes” that she featured on all of her paintings of children. That’s the one creepy moment in the film that feels Burtonesque. But you can see why the director was drawn to Margaret’s story. Like Edward Scissorhands, she’s forced to live in isolation and spends much of her time in an attic, working away. Like Scissorhands, she’s timid and naive and easily manipulated. And the big eyes she paints? It’s those paintings of big-eyed, dark-eyed, sad-looking waifs that come closest to what we expect from Burton.